The Midwest Regional has the only two double-digit seeds remaining in the NCAA tournament, but it will be No. 1 seed Virginia that reaches the Final Four. 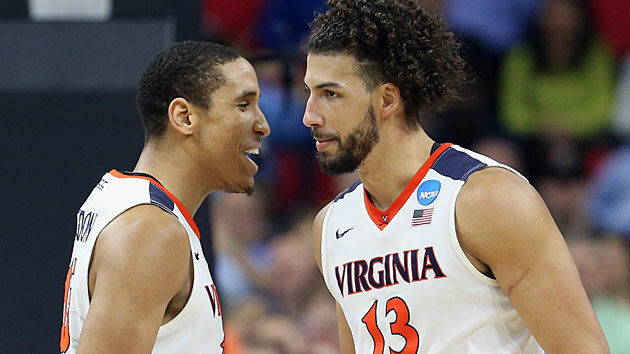 Virginia is back in the Sweet 16 for the second time in the last three seasons and is staring down its first trip to the Elite Eight since 1995. Malcolm Brogdon and Anthony Gill were at their best in the second-round win over Butler last Saturday, combining for 41 points on 15-of-23 shooting from the floor, and it’s awfully hard to see any other team coming out of this region when those two play that well. In a tournament filled with upsets and scares, the closest the Cavaliers came to being nervous was when they faced a five-point second-half deficit against the Bulldogs, which took Virginia, the slowest team by tempo in the country, all of eight minutes to turn into a six-point lead. It’s all chalk at the top of the region, with No. 4 seed Iowa State looming in the Sweet 16. The bottom half of the region, however, epitomizes the first weekend of this year’s tournament, with a pair of double-digit seeds in No. 10 Syracuse and No. 11 Gonzaga squaring off for the right to go to the Elite Eight. Even with the strong Cyclones on deck, the Cavaliers are an overwhelming favorite to reach the Final Four. With apologies to Kyle Wiltjer, Domantas Sabonis and the rest of the Zags, Iowa State is Virginia’s greatest remaining challenge. The Cyclones were impressive in their dismantling of No. 13 Iona and No. 12 Little Rock, shooting a combined 53% from the floor and 48.8% from behind the arc in those two wins. Just like the Cavaliers, Iowa State has veterans all over the floor, including an elite talent in senior forward Georges Niang, who can take over a game for stretches at a time, and a rock steady point guard in junior Monte Morris. In all, there will be eight juniors and seniors among the 10 starters in Friday night's game at Chicago's United Center. That’s uncommon for elite teams in college basketball these days, but it speaks to the programs that have ben built in Charlottesville and Ames. In a Sweet 16 filled with compelling matchups, this could be the best one of all. As good as guys like Brogdon, Gill and Niang are, Sabonis is something they are not: a potential lottery pick this June. The 6'11" sophomore is one of the most efficient scorers in the country, connecting on 61.4% of his twos and 76.8% of his free throws. He has the size and scoring touch around the basket to really upset Syracuse’s zone, and he makes Gonzaga the sort of team that can collapse the 2-3 and then shoot over the top of it. Should the Bulldogs win on Friday, Sabonis would be a very tough cover for the Virginia-Iowa State winner, as well. He’d be too big for the 6'8" Gill and too fast for 6'11" Mike Tobey in a matchup with the Wahoos, while the 6'9" Jameel McKay would be the only real option for Cyclones coach Steve Prohm to call on. If Gonzaga marches to its first Final Four, it will likely be on the back of Sabonis. Tony Bennett has turned the Cavaliers into a national power on the strength of a pack-line defense that ranks fourth in adjusted efficiency this season, the team's third straight year in the top five. To get to its first Final Four since 1984, Virginia will likely have to go through two of the country’s best offenses. Iowa State ranks third in adjusted offensive efficiency, trailing only Michigan State and Kentucky (rest in peace). Gonzaga is 23rd (Syracuse, the underdog in its game, is 52nd), and is led by one of the country’s deadliest shooters in Wiltjer, a senior forward who averages 20.4 points per game and shoots 43.2% from three. Brogdon and Gill prove too much for Iowa State in a Sweet 16 game for the ages, and Gonzaga will be stymied by the Cavaliers' suffocating defense in the Elite Eight.